Traditionalism and the French "New Right"
For those who read French... A new paper on Traditionalism and the French "New Right:" Stéphane François, "Contre le monde moderne: la Nouvelle Droite et la 'Tradition'" (Religioscope, études et analyses n° 21, July 2009). François traces the Traditionalist current within the French New Right (notably, the GRECE of Alain de Benoist) from its origins in the 1970s through its growing importance during the 1980s to the current day. He argues that Traditionalism has been important to the New Right in providing a basis for the reconstruction of Indo-European paganism as well as for its contribution to the New Right's anti-modern discourse, but that difficulties have arisen over Islam. Traditionalists in the French New Right have differed over whether to welcome Islam, following Guénon, or to reject monotheism, following Evola. Those who have welcomed Islam and monotheism have, according to François, often ended up leaving the New Right proper, ending up in more regular conservatism, if of a somewhat extreme variety. For those who read Russian, eight articles on Dugin's Neo-Eurasianism are to be found in the web-journal Forum noveishei vostochnoevropeiskoi istorii i kul'tury vol. 6, no. 1, 2009. Guénon has finally appeared in an Egyptian soap opera! Hatsuki Aishima, a scholar working on Abd al-Halim Mahmud (1910-78), a celebrated rector of the Azhar in the 1970s, found Guénon in a multipart Ramadan soap opera devoted to the life of Abd al-Halim Mahmud. Of course, one has to simplify a bit for television. Guénon was not the only Frenchman who Abd al-Halim Mahmud knew. The other was Louis Massignon, the celebrated scholar of Islam who taught him at the Sorbonne. So Guénon and Massignon, who did not think highly of each other, are combined uncomfortably into one person, Frédéric. In the soap, Guénon-Massignon converts to Islam in Paris after reading the Quran with Abd al-Halim Mahmud, and then moves to Cairo, where he lives as a pious recluse in a villa in Dokki, working on ancient Islamic manuscripts. Well, sort of. The soap not only manages to introduce Guénon to Egyptian television viewers without referring to Traditionalism, but even manages to deal with Sufism without referring to Sufism--reducing it simply to generic piety, ignoring altogether anything that might seem controversial today. That's modernity for you! Source: Hatsuki Aishima, "Producing a National Icon through the Mass Mediated Hagiography: al-`Arif billah al-Imam `Abd al-Halim Mahmud and Sufism in the Egyptian TV Serials," paper given at a conference on "Islamic Resurgence in the Age of Globalization: Myth, Memory, Emotion," held at the NTNU, Trondheim, September 4-6, 2009. 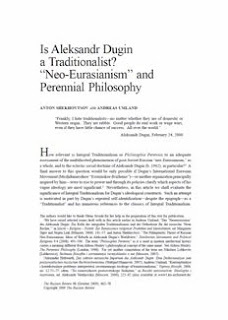 In a new article, Anton Shekhovtsov and Andreas Umland ask whether Alexander Dugin is a Traditionalist, and conclude that he is not--or rather, that he is not an "Integral Traditionalist," a term that they use and he does not. The article, "Is Aleksandr Dugin a Traditionalist? 'Neo-Eurasianism' and Perennial Philosophy" was published in The Russian Review 68 (October 2009), pp. 662–78. The basic argument is that "Integral Traditionalism" can be defined as Guénon's own Traditionalism, that Evola differs so much from Guénon that he is not really an "Integral Traditionalist," and that Dugin differs from Evola, let alone Guénon, and so cannot possibly be a Traditionalist, even if he says he is. Whether one accepts this argument or not depends on one's terminology. If by "Integral Traditionalism" one means "Guénonian Traditionalism," then Dugin is clearly not a Traditionalist, and neither are many other people who consider or considered themselves Traditionalists, probably including Schuon. If by "Traditionalism" one means a whole school of thought, in which are found disagreements and developments, then Dugin clearly has an important relationship to Traditionalism, as well as to other schools of thought. Although they do not put it in quite these terms, Shekhovtsov and Umland question whether Traditionalism so defined (that is, as defined by me and some others, and not as defined by them and some others) is sufficiently coherent to be characterized as a school of thought in the first place. Their view is evidently that, taken together, the difference between Guénon's lack of interest in politics and Evola's interest in politics, the differences concerning initiation, and the difference between Guénon's rejection of modernity and Dugin's approval of some varieties of modernization, produce contradictions too great for one label to have much meaning. This view certainly has merit, especially with regard to attitudes to politics. With regard to modernity, one might argue that Dugin is simply being more honest than Guénon in recognizing publicly that Traditionalism is not actually traditional--that it is a product of modernity, and in a sense a form of post-modernism. With regard to initiation, one might note that emphasis on initiation was a late addition to Guénon's own work. But surely a movement cannot be apolitical and political at the same time? Or perhaps it can... one can think of other examples of the apolitical being also political. What about Christianity, for example? "Render unto Caesar the things which are Caesar's, and unto God the things that are God's." And yet Christianity has not always been apolitical. Should we argue that many popes and bishops were not really Christian? I am not totally convinced by Shekhovtsov and Umland's argument, then, even though the article does raise important questions, and their examination of the relationship between the thought of Guénon, Evola, and Dugin is most interesting. Whether or not one allows Dugin the right to call himself a Traditionalist, it is useful to see how he fits in with others who call themselves Traditionalists. One last word in what is becoming rather a long post. Shekhovtsov and Umland do me the honor of devoting a section of their article to my work on Traditionalism, and even giving me my own sub-heading. Mostly, they refer to views of mine that support their argument that Dugin differs from Guénon in important ways--which, of course, he does. Sometimes they are complimentary about my Against the Modern World, for which I thank them. They also, however, repeat charges made against me and my work in reviews that, as they recognize, "sometimes seem to be driven by nonacademic motives." Indeed! Which is why I have never responded to them--as a scholar, I welcome scholarly debate, but not mud-slinging.